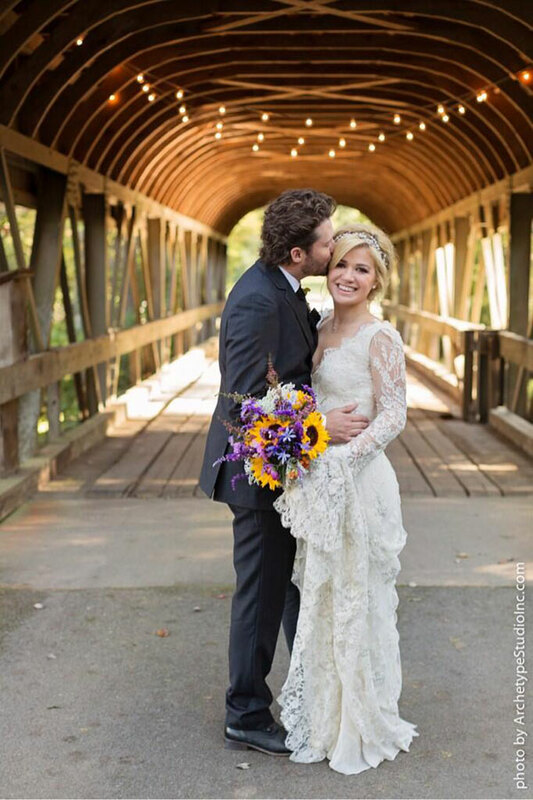 Over the weekend, reports indicated that Kelly Clarkson and her fiancé, Brandon Blackstock, might finally go through with their impromptu wedding. We’ve known for a while that the couple planned to get married soon in order to get the ceremony out of the way before she is set to film a special in support of her Christmas album later this month. On Sunday, the elopement finally occurred, in a gorgeous ceremony at Blackberry Farms in Tennessee. Clarkson may have ditched the large wedding in favor of a smaller, more intimate ceremony, but she has been great about sharing her wedding story with fans. Via Twitter, the bride thanked designer Temperly London for creating her gorgeous long-sleeved lace dress. She also posted several pictures of herself and Blackstock, including the one above and the one below, which detail the couple’s fancy frocks, as well as the lush setting for the wedding, and even the bride’s bouquet (below). According to US Weekly, Clarkson is in the process of getting her pilot’s license, and she actually flew herself and her husband-to-be in for the ceremony. Blackstock was expected to fly back out after the big event. A quick elopement with few friends and family present may not seem like the average celebrity wedding, but that’s the vision Clarkson and Blackstock have had for a while, ever since they were getting overwhelmed with decision back in August. Reportedly, Save the Date notes had already been sent out at that point, but instead of invitations, the couple sent apology notes out, instead. From the looks of things, it seems like the couple had the wedding of their dreams without having to worry about guests leaking information to the press or helicopters hovering over them. Now, Clarkson and Blackstock should be able to enjoy a few days of marital bliss, before the singer and talent manager’s busy lives catch back up to them. Here’s hoping Clarkson’s other wish also comes true for Christmas this year, as well.